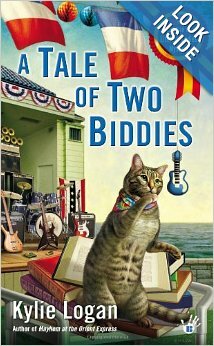 Killer Characters: A Bumper Crop of February Mysteries! A Bumper Crop of February Mysteries! We have a bumper crop of great February mysteries that you, and maybe someone special, will enjoy! Summer can be the best of times or the worst of times for the resort town of Put-in-Bay on Lake Erie. For Bea Cartwright, business is booming as guests storm her B and B for the Bastille Day celebration. In honor of the holiday, the League of Literary Ladies is reading the Charles Dickens’ classic, A Tale of Two Cities. It would be hard to make a more apropos selection—especially when they have their very own Defarge sisters, elderly twins Margaret and Alice, who run the local knitting shop. On Bastille Day, the head-banging rock band Guillotine shows their chops for the tourists—but the celebration is soon cut short. With something needling the Defarge dowagers and secrets that lead to murder, solving this mystery will be a far, far better thing than the Literary Ladies have done before. They’ll just have to make sure to keep their heads while they try to stop a killer’s reign of terror. Food critic Hayley Snow's extended family is descending on Key West like a category 3 hurricane for her best friend's wedding. But when Hayley's teenage stepbrother disappears into the spring break party scene, she must put the baking of cupcakes and other wedding chores on hold before someone she loves gets iced. MURDER WITH GANACHE has cupcakes, and local characters, and Hemingway cats, but most of all it's about finding and embracing family in whatever form they come. It's National Library Week, and the Athena Public Library is planning an exhibit to honor the centenary of famous novelist Electra Barnes Cartwright--creator of the beloved Veronica Thane series. Charlie has a soft spot for Cartwright's girl detective stories (not to mention an extensive collection of her books!). When the author agrees to make a rare public appearance, the news of her whereabouts goes viral overnight, and series devotees and book collectors converge on Athena. After all, it's rumored that Cartwright penned Veronica Thane stories that remain under wraps, and one rabid fan will stop at nothing--not even murder--to get hold of the rare books. Cheese Shop owner Charlotte Bessette's life seems quieter than ever with her fiancé out of town and her cousin Matthew and his children out of the house. But before she can put up her feet and enjoy a glass of chardonnay, Matthew asks her to play host to Noelle Adams, a bright sommelier visiting to help grow business for the local winery. An affable wine aficionado, Noelle is paired well with the cheese expert Charlotte--but something seems to be troubling the secretive house guest, and Charlotte's life is upended when she finds the sparkling woman dead. Between Noelle's hotheaded ex, the cagey owners of the winery, its jaded manager, and a wily reporter, Charlotte has her pick of suspects, but she needs to act fast--this is a mystery that only gets more dangerous with age. Spring is in the air, but the ladies of the Cumberland Creek Scrapbook Crop hardly have time to stop and smell the roses. 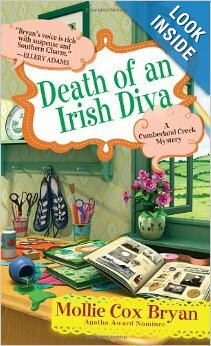 Not when famed Irish dancer Emily McGlashen is found murdered in her studio just after the St. Patrick's Day parade--and one of the Crop's own members is the prime suspect. Vera's dance studio may have suffered when Emily waltzed into town, but the croppers know she's not a vengeful murderer. Lucky for her, co-scrapbooker Annie is a freelance reporter eager to vindicate her friend. What she discovers is a puzzling labyrinth of secrets that only add question marks to Emily's murder. Just when it seems they've run out of clues, an antique scrapbook turns up and points the croppers in the right direction--and brings them face to face with a killer more twisted than a Celtic knot. 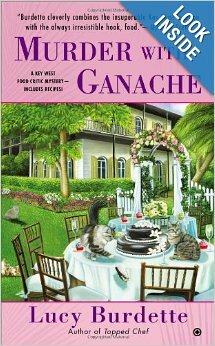 I am re-reading the first three Key West Food Critic mysteries prior to reading Murder with Ganache (which I won :-) !). Am enjoying them even more than the first time since I have been following Lucy's blogs/posts about Key West. I feel like I am there! Much better than the couple of days I spent there years ago and thought it was just too touristy. Thanks! 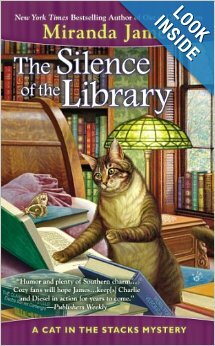 I have The Silence of the LIbrary next to my bed right now in my TBR pile. 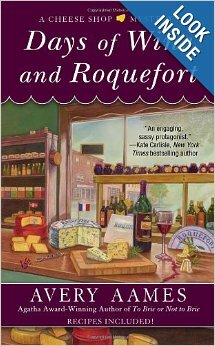 I am a couple books behind in the cheese shop mysteries and the Key west food critic. I have to catch up before I can get the latest ones. Really good series!